Ostuni holidays on line sea beach country art city travel hotels village clubs bed breakfast residence villas self-catering accommodation. The beautiful Ostuni, renown as "the white city" rises on top of a hill and its name derives from the Greek word "Astu-neon", that is the new city, built up two thousand years ago on the rests of a more ancient city, between Bari and Brindisi, along the splendid Apulean coastline. The city appearance has not changed since approximately three centuries, when the city developed and enlarged on the hillside of Casale, Cappuccini, Sant' Antonio, Molino a Vento and in the last years also in the beautiful and renowned locality of Marina di Ostuni, a tourist appeal for an unforgettable vacation by the sea, between history and art. To visit in the wonderful and unique white city of Ostuni there is also the Cathedral, from the beautiful gotico-Romanesque facade that it demanded approximately average century of jobs for its realizzaione, while to the protecting Sant' Oronzo a sanctuary on the Morone Mount is dedicated also, in top to the road of the necks and that it came reconstructed towards the half of the sec. XVII incorporating one carsica cove that had an image of the Vergine, frescoed on one wall. The territory the Murgia, on which Ostuni is set, it is called "sasso appuntito" meaning a sharp stone and it is constituted in great part from cretaceous limekilns, and it lacks therefore of water courses and valleys. In place of the water courses it boasts not deep furrows with steep walls, the so-called "lame" which means blades and enormous ravines, the famous "gravine". In these last years the bathing locality of Rosa Marine and Marina di Ostuni have rised in the vicinities, representing one of the most clean beaches in the Adriatic coastline. Both localities are one of the mainly attended zone by the most demanding tourists, for their nature and landscape beauties (sea, country and hillside) rendering more famous Ostuni also for their high quality accommodation, with optimal hotel, lodge, residence and the typical "masserie" the local farm houses providing an healthy and genuine cuisine, beyond the vastness of the historical, artistic, architectonic and cultural assets. Charmful four star hotel in Ostuni, the hotel The Summit is an exclusive property located in the historic city center, a wellness center equipped with modern and well equipped. Elegant hotel in Ostuni, Relais Sant 'Eligio is a four star hotel located right below the walls of the city from which you can enjoy wonderful views of the White City. Find the ideal hotel for your holiday in the seaside resort of Ostuni! Check our special seaside offers for Ostuni: choose your hotel with a sea view for your next summer holidays by checking the hotel and accomodation list in our guide. Treat yourself to one of Ostuni's hotels with a private beach, a few steps from the sea or choose to stay in a hotel in Ostuni with a swimming pool by the sea. Use our guide to book one of the hotels in Ostuni which provide rooms with a view of the sea. Look on the map for hotels close to the sea and the beach in Ostuni. Hotels with parking in Ostuni ? If you have decided to travel to Ostuni by car or motorbike, don't worry about finding a parking space or leaving your vehicle unattended. Display the list of hotels and accomodation in Ostuni provided with a parking place or a garage. Book a hotel in Ostuni with a parking area! Pet-friendly hotels in Ostuni ? Don't leave your dog at home. Use our guide to check the list of hotels and accomodation that welcome dogs in Ostuni. It is also possible, from our selected list of hotels and accomodation where animals are allowed in Ostuni, to keep your dog in the room with you! Check our offers of hotels and accomodation in Ostuni with rooms equipped for the disabled! For your stay in Ostuni, book a hotel accessible to disabled people. Choose your hotel in Ostuni from the list of hotels equipped to welcome disabled people! 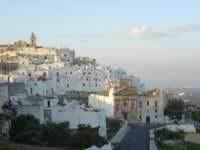 Wi-Fi hotels in Ostuni ? Are you looking for a hotel or accomodation with a quick internet access and wi.fi? Click on the list of hotels in Ostuni which have a wireless connection to internet and wi.fi. Gay-friendly hotels in Ostuni ? Look for gay friendly hotels or gay friendly accomodation in Ostuni, choose to sleep in a gay friendly hotel or gay friendly accomodation in Ostuni! Take advantage of our offers of gay friendly hotels or gay friendly accomodation to book your holidays in Ostuni.